The following article represents excerpts taken from the Blog (http://www.flicka20-wookie.com/) written by Chris Vassiliou. This information can only be published with permission given in writing by Chris Vassiliou. No changes can be made without the written consent of Chris Vassiliou. No publisher has the exclusive rights to this information. This information is distributed to several editorial magazines for printing. When I first saw the Flicka 20 on that breezy spring day (at that time named Goliath) at a small marina in St Petersburg I was impressed with her salty appearance and her hull color, which was a beautiful shiny blue. Her sheets and running lines looked dry and chaffed and several filthy fenders draped on her hull sides were gently swaying in the wind. The cockpit bulkheads were loaded with old superfluous equipment, dangling power cords and a cracked compass. I was curious how old this vessel was and began hunting for her hull identification number (HIN). After some searching I located this on the stern just above the water line. What I read was PCS201330280 (Pacific Seacraft 20 the 133rd boat built in February 1980). A few minutes later I walked away accepting the reality this little vessel was 36 years old. Several days later and quite by accident, I found myself once more staring at this Flicka and to my amazement noticed ‘For Sale’ tied to her pulpits. This time I sat on the dock box and carefully looked across the deck. Aaah the Flicka 20 !!!!! The boat designed by Bruce Bingham in the seventies and built by Pacific Seacraft in Dana, California. For the past 30 years this small vessel had sent my mind wandering across oceans and now here was one, bobbing in front of me – tugging at my heart. I sensed she was in need of some restoration and I was not fond of her name. The unsightly wires strapped all over her stern rail irritated me, as did the torn sail cover and cracked compass. This all seemed so undignified. Impulsively I called the broker and made an offer. Two weeks later the boat was hauled out in a local boatyard and was mine. The first thing I did was change the name to Wookie. Now I realize there will be those who will question the choice of this name but there was a reason for this. I had a pup called Wookie, a Lhasa Apso, small but tough, totally loyal who had bravely traveled from Sydney via Singapore to Frankfurt – a journey of over 30 hours in the baggage compartment of a 747. Once in Frankfurt and after a rather teary reunion, he traveled to many parts of Europe. Sadly a few years later he would die unexpectedly in Nice, France. Wookie was loved by many people and was a constant companion to many wine-bars, restaurants, hotels and even formal business meetings. Always well-mannered, regal, handsome but with a level of confidence, which made one believe this little fella was above everybody else. 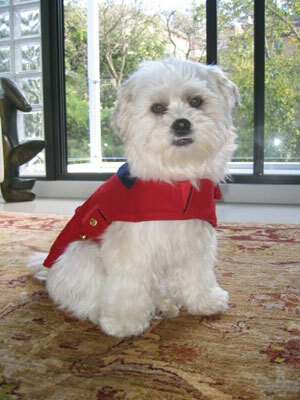 The similarities with Wookie’s qualities and my Flicka seemed obvious hence the name. Once hauled out I had an opportunity to take a really close look at the boat. Amazingly the hull below the waterline looked in great shape even though it had been four years since the last bottom job. However, what hit home was the number of thru hull fittings that were attributed to equipment not being used: two transducers for depth, a speed knot meter, an intake and outlet for the head and several screw holes attributed to the head seacock. Interestingly the intake and outlet for the head were right next to each other (literally inches apart). In addition, all of the above waterline thru-holes were plastic the majority of which were dry and in some cases cracked or broken. This was the case with the fitting for the automatic bilge pump. Water pumped out by the bilge pump ended up in the lazarette because the broken thru-hull allowed this to drain back into the bilge. There was no longer a head in the boat instead what was left was some liquid sloshing around in the holding tank, an old waste hose from the holding tank to a deck fitting, the old vent hose and as stated the seacocks. The boat yard staff did locate a smelly leaky porta potty which they gingerly carried into the dumpster as they marched by me chuckling at the look of disgust on my face. 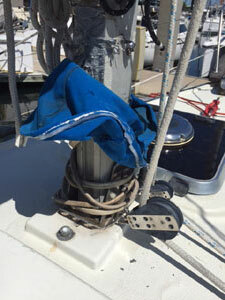 Automatic bilge hose had come off its old plastic through-hull, which as previously mentioned was broken. 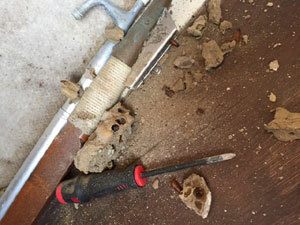 The water tank vent hose fitting had broken and had been re-attached using silicon. This amazing patch job had obviously come apart resulting in water exiting the tank and into the bilge. The wooden lids for both the head and water tanks were delaminating. Old electronic equipment – some of which did not operate. Holes in the cockpit that were not sealed allowing water into the lazarette locker. A plastic through-hull above the waterline in the stern that had no hose attached to it – basically an entrance for water and the many mud daubers (wasps). 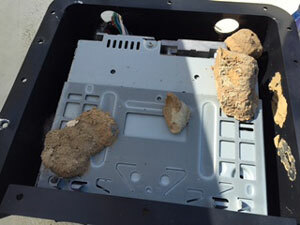 Mud dauber (wasp) nests found behind the navigation equipment, the electrical panels, the bilge, forward in the sail lockers and in the stern behind the quarter berth. Some as large as a regular coke bottle. Per Wikipedia "Mud dauber refers to the nests that are made by the female wasps, which consist of mud molded into place by the wasp's mandibles. Adults of both sexes stock their nests with spiders, which serve as food for their offspring". As these nests fell on me and broke open I was amazed to see cells stocked like the minutest larders with the remains of spiders. Wires, Wires - many, many wires - an amazing amount of electrical wires - bundled and crammed into corners all over the boat some of which had ends that went no where. Several poorly mounted electrical panels, unfortunately adding huge holes in the interior teak and with switches that did not work. Many 110v outlets including inside the sail locker/anchor well. Wooden side panels in the quarter berth and hanging locker that were delaminating due to water leaks. The top companionway step had delaminated and was not safe to stand on. Rust showing in many of the under-deck fittings. Hose fittings below decks all had a single clamp. The electrical wiring system was very confusing and a concern to me. As an example; by turning on the shore power and keeping the main battery switch off you still had 12v power. 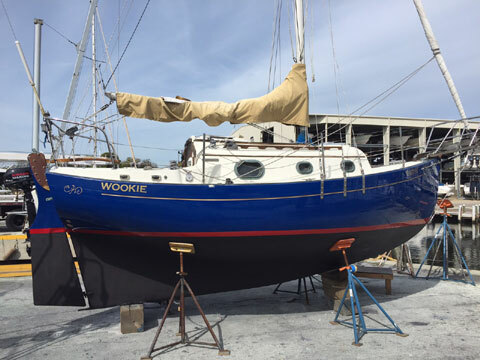 Poorly maintained bowsprit with signs of delaminating joints. Poorly maintained rudder where the tiller was mounted with sides delaminating. A deck fitting by the mast that had no wires running to it. 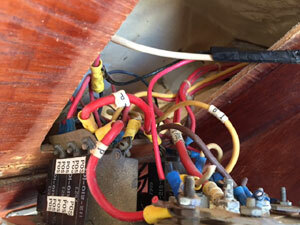 Two electrical deck fittings by the bowsprit that had no purpose. There were two stern lights the bigger of the two did not work and the mount for the smaller light was broken. The forward running lights attached to the bow were working but the big 2nm running light mounted on the bow-pulpit did not work. Furthermore it’s mount wobbled and eventually broke off during further inspection. Due to the age of the boat most of the portholes leaked as the gaskets were in need of replacement (a serious issue as the original manufacturer of these portholes was no longer in business). At this stage I will stop because the list goes on and on. Now let's be clear - I believe all boat owners have a right to do whatever they want with their boats. I respect this, as I am fully aware we yachties have our own special way of doing repairs and adding new toys to our boats. After all this Flicka was 36 years old and had belonged to several owners. The boat looked like it had been sailed and used happily for many years. My comments here are not intended to judge but mainly to list out what I personally deemed necessary to repair, replace or dispose of. 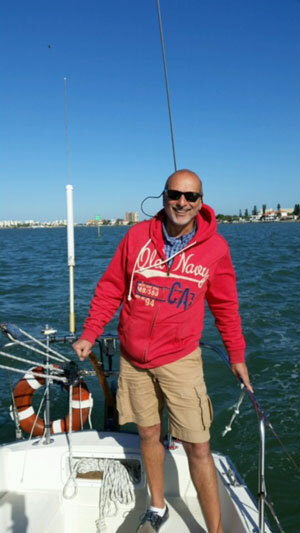 I have always felt the enjoyment of sailing is dependent on having a sound vessel when one leaves the dock. In addition to the usual safety gear, it is important the vessel’s integrity is sound and dependable. In my humble opinion, my new little vessel was far from this. I had a lot of work to do - more than I bargained on but at the same time exciting. Please let Alison know what you think about this section of Sailing Texas. We need feed back!